conveyor belt added to moon. Speech bubble added for in game info… and fun. Pink Bouncy Castle ,and more blimps and a sky trampoline. Updated Office environment actual replica of our office, including work stations. 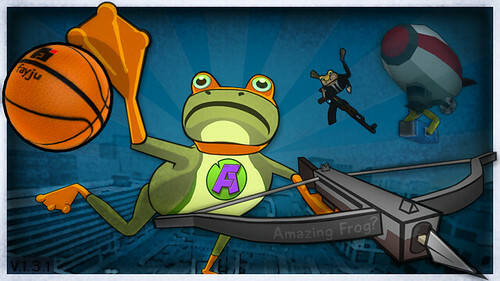 Amazing Frog Version 1.2 releases 22 July 2013 Changes and updates. 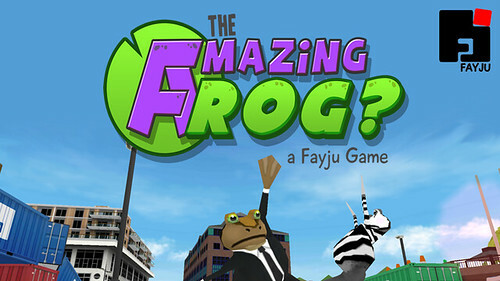 So here are the changes that we made for version 1.2 currently available on OUYA. We think of this as the OUYAPark and toilet update. The toilet can be unlocked by a purchase, you can use the toilet to change costume, of which there are 25. An intro inserted to introduce the character, caravan, toilet and Swindon. Use the OUYA button to exit to Intro. Blimp balloon is now Bouncy. More Blimps, we love the blimps! Pick up objects and throw objects with Y. 3 hidden trophies in each “Day” to find. OUYA boxes to find and throw (some hidden). Boom Box when thrown changes music track. TVs pickup able, but heavy. Basketball added and more footballs. Introduction of Basket ball hoops. Trucks and cars continuously spawning throughout is fixed. Virtual replica of the OUYA Park from E3 transported from Los Angeles to Swindon, including the game schedule on a white board. Score signs only pop up on your best score so far. Score also displays your game total. Stand up button more reliable. fixes to loss of control when stuck on moving objects. Graphical enhancements in texture quality throughout. Trampoline fixed pause on high bounces. Fixed Screams to be more legible. Glitch on Bouncy castle step fixed (sorry it was hilarious though) there are still other places to glitch out. XBox and playstation 3 controller support fixes. OUYA Menu button to exit gameplay to intro. Culling optimisation for improved frame rate. And some other stuff – Among which – take out coffee cup, can of coke, news papers to find and read…..
New controls – jumping and standing up are now on different buttons (the jump button should still give slight boosts while in ragdoll to avoid getting stuck) Also the up and down camera movement no longer locks to a smaller limit after pushing the focus/zoom camera button. Added an extra push while in ragdoll for better in air control and to help avoid getting stuck on/in things. sound effect tweaks on footsteps (wetter), boom boxes (lowered the volume a little) plus sounds for the trampolines and mattresses. 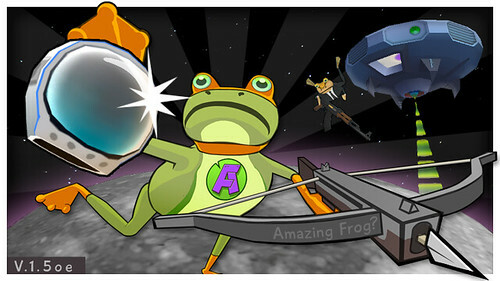 There is also a chance that cheeky frog might break wind while idle or when picking himself up. 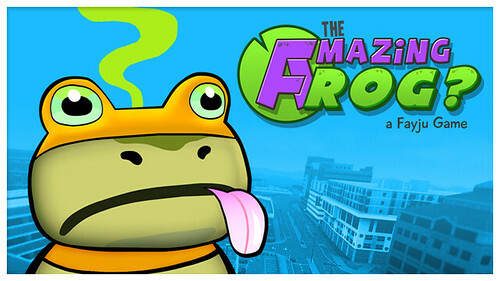 New frog shaders to make it easier to see when you are behind objects or chasing your friends. 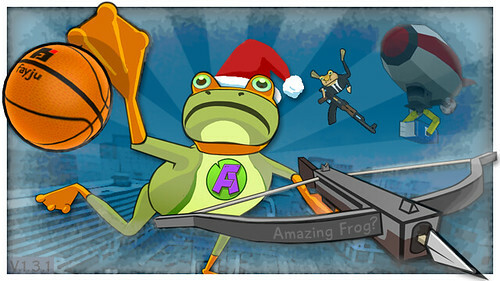 Working cannons, aim and then fire with the jump button. (I’m thinking we need to hold and charge for extra power – next update) walk up to the back of the cannon to enter (still some glitches here but we’ll get it fixed for the next update). footballs(soccer balls) to kick about/trip on + giant beach ball. Improved fan functionality, you can now get sucked in from behind and spun about. Improved trampoline functionality, no more hovering above it. Super improved wheelie bins, friends can now easily push you around if you’re riding inside. New hidden wearable crown. 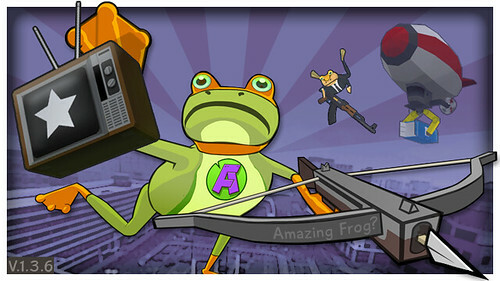 Get hit by a second player and it falls off, fight to be the king of frog town! hidden fruit for no reason, eventually items like these will be inside the breakable boxes and crates.